Filed under: Art,Fun,News and Current Events,Personal,Red Herrings,Review — Posted by the Network Geek during the Hour of the Dog which is in the evening time or 8:45 pm for you boring, normal people. The Nerf N-Strike Vulcan EBF-25 is ten kinds of awesome! Okay, so my N-Strike Vulcans arrived today. They rock! Well, okay, I only unboxed one, but this one rocks so hard you can feel it a county away. Truly. So, when I first got it and tore into the package there was a wire, or three, on everything that I quickly got tired of untwisting. When I got the kitchen shears and started just cutting them off, things went much better. It took a little bit of playing to get all the parts to snap into place, especially the ammunition box that holds the belt. The other thing that was a little tricky was the battery compartment. When I first got the batteries in, and tried to fire, I got nothing. So, afraid that I’d gotten a defective one, I tested the batteries in a lantern. Once I had tested all six of the D-cells that this monster needs to be fully automatic, I got the battery tray set and locked down, then, joy of joys, very quickly shot an entire belt of ammo across my living room. Then, I did it again, just to make sure the mechanism was working correctly. Only after all that did I clip on the tripod and start taking pictures. You’ll notice in the picture that there’s also a spare belt and a carry strap. Also, the package of eight batteries is in the picture. Or, rather, the last two of the eight, because, you know, the other six are in Vulcan. The tripod has two push-button releases that let it snap on and off. One weird thing about it, though, is that it makes a funny grinding noise when you move it and the legs fold up when you pick it up. A commenter mentioned that his “sukz” and didn’t shoot well. Sadly, he must have gotten a defective one because mine shoots fine. Actually, mine shoots well. Never jammed, belt fed all the way through, and the darts all flew more than his all-too-short three feet. They also flew straight and true and fired off at a decent rate. Oh, and it’s noisy, too. Not sure if that’s a good thing or not, but it does have a definite, meaty, mechanical, macho sound when it hurls little Nerf darts of joy at your opponent. Seriously, this is totally cool and worth every penny I spent on it. Every. Last. Penny. I mean, c’mon, it’s a fully-automatic, belt-fed Nerf MACHINE GUN! If you loved Nerf guns as a kid, you owe it to yourself to get a Nerf N-Strike Vulcan EBF-25. Totally worth it! Filed under: Fun,Fun Work,Geek Work,Linux,MicroSoft,Ooo, shiny... — Posted by the Network Geek during the Hour of the Tiger which is terribly early in the morning or 5:04 am for you boring, normal people. Yes, a do-it-yourself computer notebook. Filed under: Fun,Fun Work,Geek Work,News and Current Events,Red Herrings,Rotten Apples,The Dark Side — Posted by the Network Geek during the Hour of the Horse which is around lunchtime or 12:28 pm for you boring, normal people. Oh, wow, I almost missed it this year! Today is System Administrator Appreciation Day. I was reminded by Gizmodo that today is the day to remember the geeks that make your network run. Sure, you’d mostly rather see us locked into our server rooms and hardware closets, but, admit it, when something goes terribly wrong with your computer or network, you’re actually happy to see us. So, since you’re able to read this, find your local system administrator and tell them thank you for letting you waste time reading my blog on the Internet instead of working on a Friday afternoon. Comments Off on Happy Sysadmin Day! Filed under: Art,Fun,Fun Work,Geek Work — Posted by the Network Geek during the Hour of the Tiger which is terribly early in the morning or 5:40 am for you boring, normal people. Oh, does this bring back memories! Back in the day, when I was just a young lad and the web was still new and shiny, there was a magical place called Webmonkey where you could learn about HTML and CSS and all manner of web-related things, for free. And, oh my children, the glorious cheatsheets and references! Why, you’ve never seen such wonderful resources! But, then came a sad time on the web, and this hyperlinked land of magic and wisdom became dated. The wizards who made it run moved on to other kingdoms where the gold may have flowed a bit more easily. And, sadly, the web playground that was Webmonkey laid down for a long, long sleep. Well, finally, after all this time, Webmonkey lives again and he’s had a makeover! Comments Off on Webmonkey Lives Again! Filed under: Fun,Ooo, shiny...,Personal,Red Herrings — Posted by the Network Geek during the Hour of the Horse which is around lunchtime or 12:28 pm for you boring, normal people. 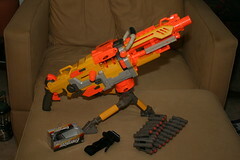 I ordered two Nerf N-Strike Vulcan EBF-25’s yesterday. Why, you ask? Because I can. Seriously, I’ve been watching this since I heard the announcement about it on Gizmodo.com. These were supposed to have been in stock, but sold out. So far, I haven’t heard about anyone actually buying them, though. Naturally, when I saw that the Hasbro website was claiming they were in stock, I had to order one. And, just in case, I thought I should go ahead and order two. Oh, one thing to know, too, is that for the same price as the regular EBF-25, at the Hasbro website, you can get the Nerf N-Strike Vulcan EBF-25 value pack, which includes a carry strap and a spare belt for your FULLY AUTOMATIC BELT-FED NERF MACHINE GUN! Sorry. I guess my inner child is looking forward to getting this. Filed under: Advice from your Uncle Jim,Criticism, Marginalia, and Notes,Life Goals,News and Current Events,Ooo, shiny...,Personal,Red Herrings — Posted by the Network Geek during the Hour of the Tiger which is terribly early in the morning or 5:30 am for you boring, normal people. No, I’m not extra tired this week. Long-time readers of this blog may recall that I occasionally obsess about things like alternative energy, in particular solar energy. In fact, if I could afford the entry price for adding solar power to my house, even as an emergency backup system, I’d be on it like white on rice. Seriously. So, when I saw this article from ExtremeTech about one fellow geek’s experience going solar, I was thrilled and had to share it. I don’t know how I missed the first article a month ago, where he announced that he was going to do this, but, well, this is the one that is really interesting anyway. If you read the article, you’ll see that solar is far from a perfect solution, and we have yet to see how well it works for him in the winter months, but it’s still the best thing going, I think. I mean, once you get through the initial install and take that first hit for the equipment, it seems like it would pay for itself very quickly, to me. Especially in the Southern and Western states where we get more Sun and more uninterrupted Sun. Also, in recent years solar panels have really improved their efficiency making it easier to generate more power with fewer panels, which, obviously, can make a huge difference. So, I may be a ways off from doing something like this myself, unless I find a generous benefactor of some kind (haha! ), but when I see good, even-handed articles like this, I’ll bring them to your attention. "If I were beautiful like you, I'd have so many friends I could hurt one and I wouldn't have to make amends." Filed under: Advice from your Uncle Jim,Geek Work,News and Current Events,The Dark Side — Posted by the Network Geek during the Hour of the Rooster which is in the early evening or 6:09 pm for you boring, normal people. Have you been reading about this network administrator in San Francisco who was keeping key passwords secret and holding the city’s fiber network hostage? Yeah, well, he gave them up to the mayor today. And, you know what? I bet there are a lot more companies in this situation than realize it. Okay, maybe they don’t have to worry about being taken hostage by a disgruntled employee, but they may have someone who holds key information for their network that no one else has. And, of course, if something happened to them, well, that company would be in a bad spot. I, for one, always try to plan for being gone. You know, in case I were trapped under a rock, hit by a bus, or, oh, I don’t know, died of cancer. And, I’m not the only one. So, if you want to protect your business, plan for your network administrator to fall through a figurative manhole. Don’t let what happened in San Francisco happen to you and your business! Filed under: Art,Criticism, Marginalia, and Notes,Life Goals,Life, the Universe, and Everything,Personal,Red Herrings — Posted by the Network Geek during the Hour of the Monkey which is in the late afternoon or 5:23 pm for you boring, normal people. Today is Ernest “Papa” Hemingway‘s birthday. He was born in Oak Park, Illinois, which is not far from where I grew up, in 1899. Hemingway snuck off to fight in World War I when he was just 17. He got hurt early in the war, while serving as an ambulance driver, and spent weeks in the hospital before coming back home to his parents in Oak Park. After his parents got tired of him hanging around, he started writing stories for Chicago newspapers and magazines, and then got a job as a foreign correspondent for the Toronto Daily Star and went off to Paris with his wife Hadley. He became friends with a lot of writers who were in Paris at the time, including Fitzgerald and Joyce and Pound and Gertrude Stein. And he wrote every day, sometimes in his apartment, sometimes in cafés, but he wrote every day. It’s this model of what a writer does, how he works, that I’ve always wanted to emulate. But, honestly, the blank page has grown far too frightening to do that. Oddly enough, Hemingway developed cancer and, in fact, grew his famous beard in an attempt to hide some of the scars which were a result. In the end, he couldn’t live with the idea of cancer, or what it meant to his life and, in true “Hemingway hero” fashion, killed himself with a shotgun in 1961. But, by then, he was one of the most recognizable people on the planet. Ernest Hemingway has been one of my heroes since I first read his work. Not his most famous, Old Man and the Sea, but rather some of his shorter work. As I recall it was “A Clean, Well-Lighted Place” or, possibly, “The Killers”. That, along with The Snows of Mount Kilimanjaro and The Sun Also Rises were the books and stories that got me. The funny thing is, I’ve read that he really didn’t care for the Old Man and the Sea, even though that won more awards than anything. I’ve read more of his work, of course, though certainly not all. In fact, there was a time I wrote trying to emulate his style. He’s also where I learned that the most beautiful art is that which seems so simple, so obvious that one thinks it must be easy to create, but then finds the execution of such art much harder to accomplish after all. So, if you’re the drinking kind, raise your glass, whether that’s a daiquiri, absinthe, a martini, or a mojito, which are all said to have been his “favorite” drink at various times, and toast to Papa and all he wrote. Filed under: Art,Criticism, Marginalia, and Notes,Fun,Movies,Review — Posted by the Network Geek during the Hour of the Pig which is in the late evening or 10:57 pm for you boring, normal people. I saw The Dark Knight today. I feel confident that this is going to be the best movie of the year. I have to admit I was a little dubious based on the massive amount of publicity the movie’s gotten and all the rave reviews my friends gave it. I mean, when they compared Dark Knight to the Godfather movies, well, I thought the reviewer had lost his mind, but I think they may be onto something. So, the Dark Knight picks up where Batman Begins left off. Batman Begins retells the origin story of Batman in a way that’s closer to the original comic than the first movie did. This movie continues with that story, though Maggie Gyllenhaal replaces Katie Holmes as Rachel Dawson and Aaron Eckhart joins as Harvey “Two Face” Dent. Christian Bale still plays Bruce Wayne/Batman, with Michael Caine as Alfred and Morgan Freeman as Lucius Fox, not to mention Gary Oldman as Jim Gordon. The story opens with Batman fighting a number of criminals in a parking garage, along with some Batman copycats sort of getting in his way. He seems to find the whole thing a little depressing, having copycat vigilantes. He’s also sort of looking for a way to retire, once the city is safe from organized crime. For this, Bruce looks to Harvey Dent, the Gotham District Attorney. He’s the last honest man, outside of Jim Gordon, in the city and he’s putting away plenty of criminals. He’s also dating Rachel Dawes, much to the pain of Bruce Wayne. Well, it seems he has his work cut out for him when he goes up against a new kind of criminal, the Joker, played by the late Heath Ledger. He’s scarred, both physically and mentally, and appears in makeup to hide both. But, his crazy shows through both when he kills his accomplices and offers to kill the Batman, for a fee. So, off he goes, in his crazy way, using random violence and our own worst nature against us. Well, I don’t want to give away too much plot, because you all really have to see this movie, so I won’t tell you more, but it is a violent roller coaster through a dark world of back alleys and sub-levels and ruined buildings. There are explosions and guns and more explosions and hand-to-hand action and car chases. But, oddly, there’s also a fair amount of philosophy, brilliant dialog, and social commentary. But, none of that stuff gets in the way of the story or the action. The sets and cinematography are brilliant, too. Oh, and most of the movie was shot in Chicago and near where I worked for several years. I kept seeing things in the background that totally reminded me of home. In a good way. I’m sure I’ll see this movie again, possibly on IMAX. The friend I saw it with today had already seen it twice before and was talking about seeing it again. Dark Knight is one of those movies that you can watch many times, finding more each time you watch it. It truly is the best of the Batman films and, really, is one of the best films I’ve ever seen. I cannot encourage you enough to see this film. 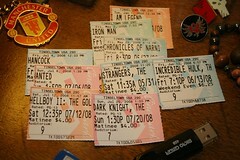 If you see no other movie this year, make it Dark Knight.